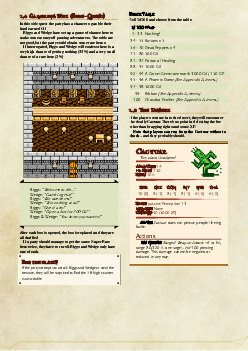 An 8-bit Adventure is a is a short comedy 5e Dungeons & Dragons module, designed for a group around levels 4 - 7. It is supposed to be completed in a single 3 - 4 hour sitting. The players shouldn't find the difficulty very challenging, the fun is in the silliness of the setting. It's designed to be slotted in to an existing campaign as a one-off special adventure. The adventurers find themselves trapped in a world inspired by JRPG tropes and must find a defeat the evil sorcerer Garland to escape. 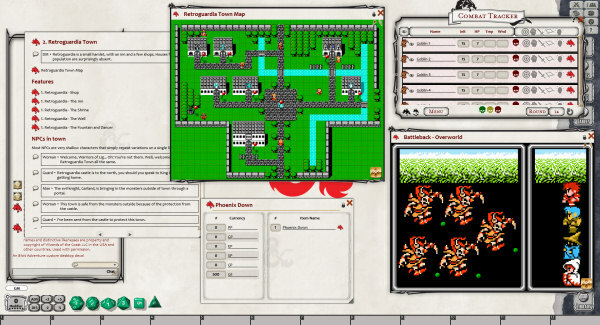 An 8-Bit adventure is available as a PDF or a Module for the Fantasy Ground virtual tabletop software. Multiple locations to explore, including a town and dungeon. 8-Bit themed monsters, NPCs and items. Rules to run simplified combat. Minecraft Fluxx a themed Fluxx variant. Heroes and Villains a playset for Fiasco. Astro Ball a retro-styled pool-like computer game. If you enjoyed this D&D module, I'd love to hear from you. Send me a tweet @JiFish. This is a fan creation. It is not intended for any commercial use. See the licence for full details.